The coastal route is the longest of the national cycle routes – about 4,500 kilometres – and varies between easy and more challenging terrain. It follows the long and scenic Norwegian coast from the east to the south, through Fjord Norway with the most famous fjords, and all the way up to Kirkenes on the Russian border in the northeast. We recommend that you cross some fjords by alternative transport such as ferries to avoid long detours around each fjord. The route also includes some tunnels. The coastal route is the longest of the national cycle routes – about 2,796 miles – and varies between easy and more challenging terrain. It follows the long and scenic Norwegian coast from the east to the south, through Fjord Norway with the most famous fjords, and all the way up to Kirkenes on the Russian border in the northeast. The canal route takes you right across Southern Norway, from Porsgrunn via Skien and the Telemark Canal, which was etched into the mountain more than 100 years ago and known as “the eight wonder of the world” when it was finished, to Dalen and all the way to the coastal city of Stavanger. Though it crosses the country in a rather hilly terrain, this route is actually one of the shortest national cycle routes at 466 kilometres. The canal route takes you right across Southern Norway, from Porsgrunn via Skien and the Telemark Canal, which was etched into the mountain more than 100 years ago and known as “the eight wonder of the world” when it was finished, to Dalen and all the way to the coastal city of Stavanger. Though it crosses the country in a rather hilly terrain, this route is actually one of the shortest national cycle routes at 290 miles. Starting in Kristiansand in Southern Norway, this route visits Hardanger and crosses the Sognefjord before terminating in Kristiansund in the northwest. 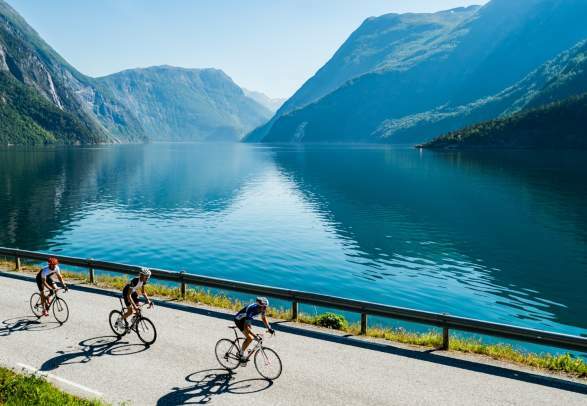 The craggy mountains and deep fjords of Fjord Norway are the focus of this 1,000 kilometres long route, which will take you through some of the most scenic parts of Southern Norway and inland Fjord Norway. Starting in Kristiansand in Southern Norway, this route visits Hardanger and crosses the Sognefjord before terminating in Kristiansund in the northwest. The craggy mountains and deep fjords of Fjord Norway are the focus of this 623 miles long route, which will take you through some of the most scenic parts of Southern Norway and inland Fjord Norway. 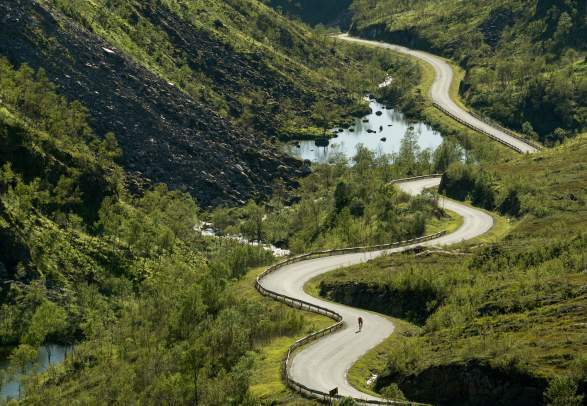 Originally a transportation road from the construction of the Bergen Railway, part of Rallarvegen is now one of the most popular bicycle routes in Norway and offers both a historical and a close-to-nature adventure. But this 614 kilometres long national bicycle route stretches far beyond Rallarvegen and takes you from Bergen via Voss to Finse. From Finse, the highest point on the Bergen Railway, it’s more or less all easy downhill cycling to Oslo. Read more about Rallarvegen. Originally a transportation road from the construction of the Bergen Railway, part of Rallarvegen is now one of the most popular bicycle routes in Norway and offers both a historical and a close-to-nature adventure. But this 382 miles long national bicycle route stretches far beyond Rallarvegen and takes you from Bergen via Voss to Finse. From Finse, the highest point on the Bergen Railway, it’s more or less all easy downhill cycling to Oslo. Read more about Rallarvegen. Starting in the picturesque seaside town of Larvik, the 950 kilometre long Numedal route takes you via the old mining town of Kongsberg to the high mountains of Dagalifjellet and Geilo. From Larvik to Dagalifjellet, the highest point of the route, there is a difference in altitude of 1,000 meters. 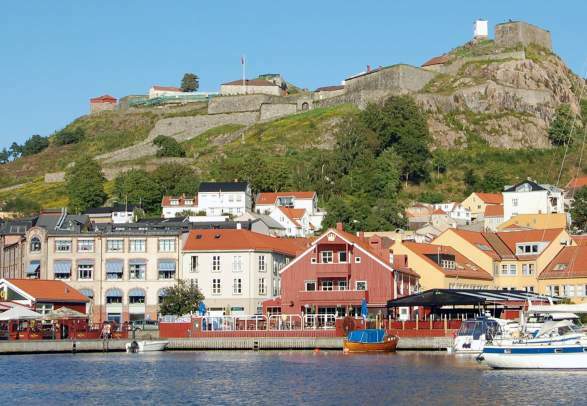 Starting in the picturesque seaside town of Larvik, the 590 mile long Numedal route takes you via the old mining town of Kongsberg to the high mountains of Dagalifjellet and Geilo. From Larvik to Dagalifjellet, the highest point of the route, there is a difference in altitude of 3,280 feet. Starting in the mining town of Røros, a UNESCO World Heritage Site known for its old wooden buildings and for being one of Norway’s leading regions for locally produced food, the 294 kilometre long Sognefjellsvegen takes you through the mountains of Trøndelag and continues across the country to the famous fjords of Fjord Norway, before it ends in Hardanger. Starting in the mining town of Røros, a UNESCO World Heritage Site known for its old wooden buildings and for being one of Norway’s leading regions for locally produced food, the 183 mile long Sognefjellsvegen takes you through the mountains of Trøndelag and continues across the country to the famous fjords of Fjord Norway, before it ends in Hardanger. Sognefjellsvegen is signposted between Otta and Lom. Halden near the Swedish border in Eastern Norway is the starting point of this 600 kilometre long cycle route which takes you through Norway’s capital Oslo and along the old pilgrim route past the lake Mjøsa and the ruins of the Hamar cathedral, and northwards all the way to Trondheim, where you will find Norway’s national sanctuary the Nidaros Cathedral. Halden near the Swedish border in Eastern Norway is the starting point of this 373 mile long cycle route which takes you through Norway’s capital Oslo and along the old pilgrim route past the lake Mjøsa and the ruins of the Hamar cathedral, and northwards all the way to Trondheim, where you will find Norway’s national sanctuary the Nidaros Cathedral. The 160 kilometres long Trollheimen route is one of the shortest of the national cycle routes and will take you from the small inland town of Oppdal through the valleys and mountains of Trollheimen – one of the most dramatic and picturesque areas in the country – to the city of Molde on the western coast. The 100 miles long Trollheimen route is one of the shortest of the national cycle routes and will take you from the small inland town of Oppdal through the valleys and mountains of Trollheimen – one of the most dramatic and picturesque areas in the country – to the city of Molde on the western coast. Whilst the beginning of the wilderness route is quite similar to the pilgrim route, it takes a more inland route through the wild forest of Eastern Norway via the towns of Elverum and Trysil in Hedmark, and through Røros and Selbu before arriving in Trondheim. The total length is about 825 kilometres. While the beginning of the wilderness route is quite similar to the pilgrim route, it takes a more inland route through the wild forest of Eastern Norway via the towns of Elverum and Trysil in Hedmark, and through Røros and Selbu before arriving in Trondheim. The total length is about 513 miles. This route is one of the longest of the ten national cycle routes, and will take you from the northernmost point of mainland Norway – The North Cape – to the southernmost point at Lindesnes. Note that you’ll have to find alternative transport like train or local buses at some places because of tunnels that aren’t open for cyclists. Challenging mountain roads are waiting all over Norway. Pleasures on a high level are shared by Geir Stian Ulstein, author of the reference guide book “Bakker & Berg”.